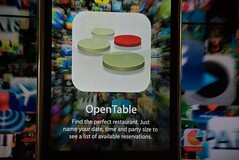 The easy button for many restaurateurs is OpenTable.com, which allows diners to make reservations 24/7 online. “The average restaurant spends $1,500 to $2,000 a month on OpenTable,” said Mr. Brown, of Ed’s Chowder House, adding that restaurants like his pay a setup fee, monthly fees and a fee for every reservation. Furthermore, while no-reservations restaurants can reach as many as four table turns a night, two may be the maximum for restaurants that take reservations, Mr. Brown said. “So for them, often the only way to cope with increasing costs is to keep charging more money.” That, in turn, can price a restaurant out of its market. I figured it must cost something, but had never really thought about how much. The middle part about needing three full time people on top of OpenTable seems a little much, but what do I know about running a restaurant... especially one that provides "a serious fine dinning experience"? But it seems OpenTable isn't providing a lot of value on top of three full time employees to me. Though I guess it's value might simply be access to the people who use OpenTable? I never used OpenTable before I got a smart phone... only rarely making reservations at all. For whatever reason, I have generally been either willing to wait or willing to find someplace down the street to eat if a place is packed. But ever since I started using OpenTable on my phone, I have indeed started to nearly ignore restaurants that aren't on it. Hell, I'll make reservations for 2 for 5:30 on a Tuesday at a restaurant that is never crowded... because... well... why not? On weekends especially, we use it to decide where we might go based on who has a table when... even if we know we could get in (nearly) wherever we want if we're just willing to wait. There are a lot of choices as to where to dine, and unless someplace is burning up Chowhound, it's hard to see the point of standing around in a crowded doorway for an hour to get a table. I guess OpenTable's runaway success suggests I'm not the only person who is beginning to think this way. While I imagine ultra-hip places are always going to be able to do a brisk business by expecting people to wait, I wonder how viable it is to stay off it for other restaurants? Surely this indicates there's a lot of room for a competing service?